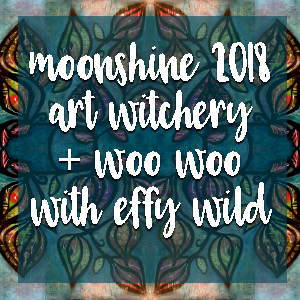 Back by popular demand, Moonshine 2018 is Effy Wild’s ‘woo woo container’ for art witchery, working with the moon in all her phases, encountering the divine through mixed media art, art journaling as a devotional practice, and more. Moonshine 2018 begins on December 31st, 2017, but includes instant access to Book Of Days Boot Camp Version 1.0 + Succulent Stacks as a way to keep you busy and get you started. If you’re new to Effy, you can find out more about her here. Hold on now, Effy! What’s Art Witchery? 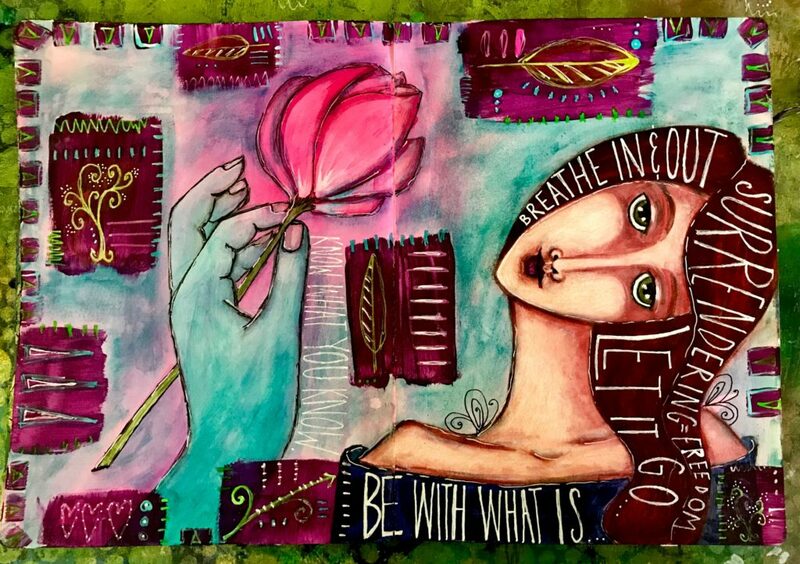 Mixed media art journaling as an offering to and a way to commune with the divine as we understand it. Accessing our inner wisdom through creative practice. Working with the phases of the moon, moon lore, and calendrical, agricultural, and astrological lore. The use of various oracles (tarot, ogham, runes, animal, etc.) as portals into our creative practice. Ritual & ceremony as ways to support our creative practice. Altar building (using our own art). The development of a coven of art witches who will be friends for life (and maybe beyond!). Moonshine originally focused entirely on iconic portraits, but this year we have expanded our focus to include whatever imagery feels most relevant to us based on our own journeys. 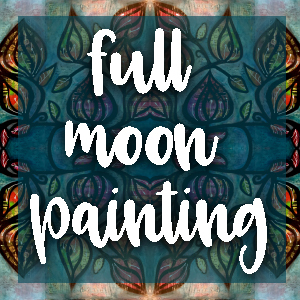 There are two art projects offered per month – one, which will be time lapsed, is a new moon vow journaling project and the other, a full moon mixed media painting tutorial that can be done either in the art journal (my favourite way to work) or on any other substrate (canvas, wood panel, loose watercolour paper, etc.) that you desire. You will be encouraged to ‘go your own way’ throughout this class, seeking out your own palettes, imagery, symbols, and practices, and for that reason, Moonshine is best take by intermediate to advanced mixed media artists. Beginners would be better served by beginning with Book Of Days, which is suitable for all levels, and includes just enough of a taste of the creative spirituality we dive deeply into here in Moonshine to prepare you for next year. Moonshine is regularly priced at $120 for the entire year, but you can have it now for $99. Please note that there is a BUNDLE available, and also a PAYMENT PLAN. The bundle includes a discount. The payment plan *does not*. An example of spiritual work done in the journal as will be taught in this class. 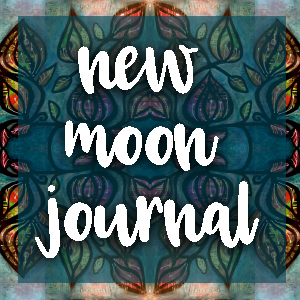 Time lapsed for your entertainment and inspiration, this will come to you in the form of a quick video with written instructions on how to create a new moon vow art journal spread. This mini ritual that includes ceremony and art as a way to make magic will be uploaded to your classroom on the evening before each new moon throughout the year. This part of the class will include an invitation to join me on Facebook for a new moon check in thread, where we will make our vows together as a coven of art witches. Those who prefer not to engage on Facebook will be invited to send me their vows via email so that I can witness them (but only if you like! This is completely optional). More on vow-making (and other forms of art witchery) will be included in the introductory packet, which you will receive at the beginning of the year. 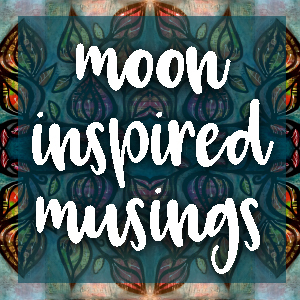 One new mixed media art journaling session meant to explore and employ the energies inherent in the full moon, (which will change from moon to moon) as well as any other correspondences that resonate or come up for us. Includes HD video, (all downloadable!) and a full colour PDF walkthrough with supplies lists and step-by-step instructions. In these videos, you will find that only the boring bits are time lapsed. The rest will be real time, and include my thoughts as I’m working. BONUS: You will also find these videos offered as a quick-to-digest time lapsed format for inspiration & entertainment for those times when you find yourself just wanting to commune with the work without investing the time it takes to view the full length lesson. Information about the payment plan is available here. For those who wish to engage both BOD and Moonshine this year, YES! There is a BUNDLE! *For those who are seeking a more ‘secular’ experience that focuses on meeting ourselves as we are on the page, self-care, and regular creative practice, Book Of Days 2018 may be a better choice for you. For those of you looking to create or enhance your own spiritual practice, learn how to use art as a tool for transformation on a spiritual level, commune with the divine through effort as offering, or track the phases of the moon & seasons of the year through art, this is definitely for you. **Please note: This work is not in any way influenced by the Law Of Attraction, nor will I be teaching the misappropriated cultures or practices of indigenous or oppressed peoples in this class. All practices will be sourced ethically, and you will be encouraged to do the same. Although you may find some of the practice taught herein therapeutic, this class is not a substitute for therapy, or an appropriate container for heavy trauma work. You will find that Effy’s spirituality includes the political, so if justice for oppressed peoples isn’t your thing, you may not enjoy working with her. All content in Moonshine 2018 ©Effy Wild 2018, all rights reserved unless otherwise noted. Do not make videos or tutorials inspired by my content. Do not share your password or any of the content with others. Do not copy my work to sell.